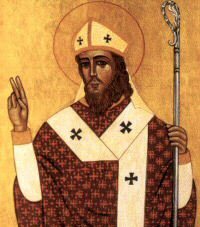 St. Hilary was born in France of a noble family as a pagan. By his reading, inquiries and bible study he became a Christian. He endeavored to convert others to Christianity. He was married prior to his conversion. He was appointed Bishop of Poitiers around 353 AD. At that time married men were sometimes appointed to the episcopacy. St. Jerome testifies that they lived in continence ever after. Hilary defended the Divinity of Christ and at the Council of Seleucia he defended the decrees of Nicea. He then retired to Constantinople. He died at Poitiers in 398AD. To you, Lord, I will offer a sacrifice of praise. A person must never be forced to act against his/her conscience. True or False?